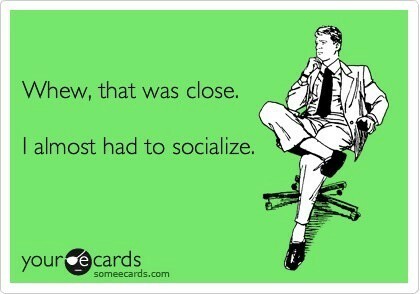 If you have read any of my other posts, you know I’m an introvert. I am an introvert who does not appear to be on because and many people don’t understand, I love people. I can be the life of the party for about 15 to 30 minutes. Then I have to disappear. If I actually attend a party you can rest assured that it was either mandatory, a mistake, it was one of those step-out-of-my-comfort-zone moments, or I had some idea of a quick and clever escape once I arrived. I have always felt my introversion was an advantage and I have learned to stop making excuses for it, but recently I am seeing that there is a clear extrovert advantage and it is making my me feel, for lack of a better phrase, some kind of way. Those who are extroverts and thrive on creating and attending social events can really put the pressure on an introvert. Especially if you find yourself in a sea of introverts. There is a very well-liked extrovert who has recently entered my circle of associates. This introvert is the one who plans get-togethers, parties, meet ups, group outings, all the things I and many introverts shy away from. Being the introvertiest person in the group, I often feel the pressure of attending these functions as all of the others are willing to accept. To top it of, I get lots of “Are you coming to this one? You didn’t come to the last one?” I feel like I am drowning in a sea of extroverts. In instances like these, I feel the extrovert has disrupted my little world. In a sea of extroverts it takes time for them to adjust to your introvert ways. I have to navigate the “it’s not you, it’s me” conversations to assure them that although I enjoy their company, I get over it quickly and want the interaction to end. Once I get them used to me, someone comes along and makes me the odd one out all over again. UGH! My little group was accustomed to me leaving events early or not going at all, and would let me do so in peace without question. Now this new introvert has reignited them. It is as if they have forgotten what kind of person I am. Now I have to start over but, that’s okay. If you plan to have a healthy and fulfilling life you have to adjust to different types of people. This instance is challenging to me but, I will work through it. Next Post Write on Wednesday #50: Thank you Georgia Butler! Reblogged this on Boo Hardy. Write on Wednesday #50: Thank you Georgia Butler!